An Erlebnis Chef’s Table Restaurant is being introduced as standard on board all Aria- and Concerto-class ships as part of AmaWaterways' (APT's) new ‘Royal Experience’ European river cruises in 2014. It will be complimentary to guests, with no additional charge beyond the cruise cost. 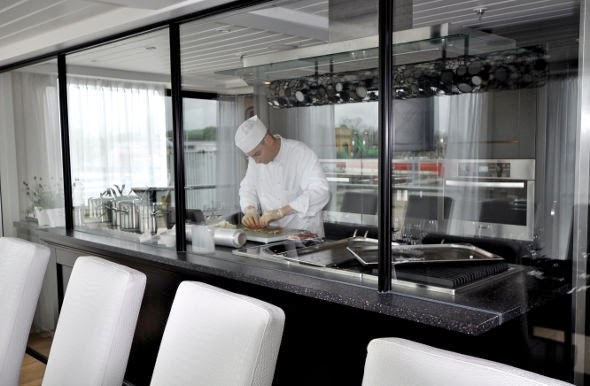 A chef at work on board AmaBella. Seating just 24 people, the restaurant features a glass-enclosed kitchen through which diners can observe their private chef preparing a special six-course degustation menu, served to guests accompanied by free-flowing drinks. The menu will be designed by AmaWaterways' Executive Chef, Primus Perchtold. With multiple awards to his name, including three gold medals at the European Championship of Culinary Art, we might imagine that guests will be treated to some fine European flavours. Incidentally, AmaWaterways is also the only river-cruise operator inducted into La Chaine des Rôtisseurs, one of the world’s most prestigious culinary organisations. Also new on board in 2014 will be a River Bistro restaurant serving quick, simple and fresh made-to-order fare. The bistros will also make an appearance on Aria- and Concerto-class ships, including the two new launches for AmaWaterways in 2014, AmaSonata and AmaReina, which will sail the Rhine and Danube. Have you travelled on an AmaWaterways (APT) ship in the past? Why not leave your comments about the on-board dining experience to share with fellow readers.